It's a fascinating and charming take on something we take for granted--our home. Bryson takes us on a tour of his Victorian English country home. 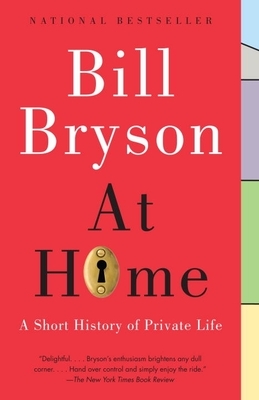 Room by room he delves into history through anecdotes and well-researched tidbits, not to mention the delightful Bryson humor. Bill Bryson’s bestselling books include A Walk in the Woods (now a major motion picture starring Robert Redford and Nick Nolte), Notes from a Small Island, I’m a Stranger Here Myself, In a Sunburned Country, A Short History of Nearly Everything (which earned him the 2004 Aventis Prize), The Life and Times of the Thunderbolt Kid, At Home, and One Summer. He lives in England with his wife.